Dearborn Partners LLC was formed in 1997. An independent, privately held firm based in Chicago, Dearborn Partners manages assets for institutional and individual clients. 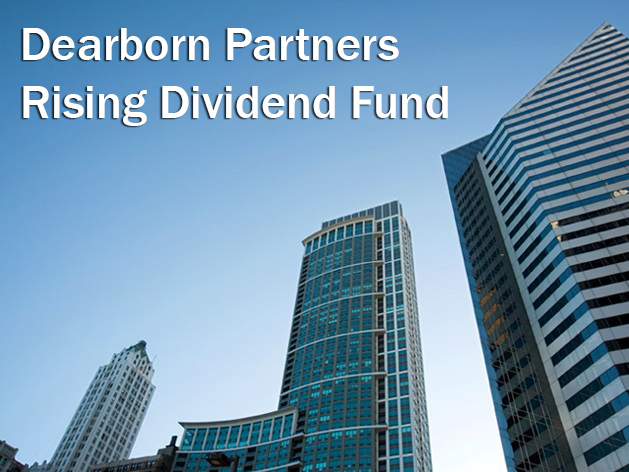 Dearborn Partners, LLC is the Advisor to the Dearborn Partners Rising Dividend Fund. The Fund invests in companies diversified across numerous sectors. We seek to own a portfolio of companies with an average yield that exceeds the S&P 500 Index and that appear to have good prospects for annual dividend growth. Our objectives are current income, rising income over time, and long-term capital appreciation. We endeavor to identify companies that appear likely to raise their dividends with regularity over time. The combination of a current yield plus the potential for dividend increases can offer investors a fund that we believe should perform well in both rising and falling markets. The Dearborn Partners Rising Dividend Fund is offered only to United States residents, and information on this site is intended only for such persons. Nothing on this web site should be considered a solicitation to buy or an offer to sell shares of the Fund in any jurisdiction where the offer or solicitation would be unlawful under the securities laws of such jurisdiction. Click here for a current Prospectus. Please read and consider it carefully before you invest.